A robot western, what's not to like about that? There is only one human in this book and they get killed off pretty quickly. The rest of the story revolves around a post apocolyptic world inhabited only by robots. Our hero 'Brittle' survives by travelling the desert wastes looking for parts she can use to recycle and trade. Soon she finds she is being hunted, and as the story unfolds we discover why humanity is gone and how the mega-computer rose to power. There’s a lot here that you might recognise. Think A.I. 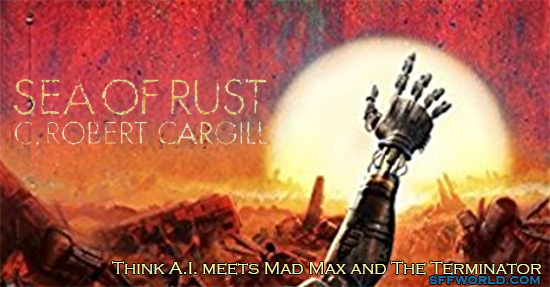 meets Mad Max & The Terminator, with a knowing nod to Isaac Asimov’s ideas and Colossus: The Forbin Project. It is a supremely well-thought-out scenario, with the future being a sensible extrapolation from now. The result of this proliferation of robots and artificial intelligence is a wonderfully imaginative world that seems right. It would be easy to have mass-produced robots being rather uniform in manner and purpose, yet the author has clearly made a great deal of effort in imagining a variety of different types of robots with different mannerisms and characteristics.